Born 1865, Dorchester, Dorset, England. Died 1931, Dandenong Ranges, Victoria. A leading artist of the Heidelberg School of Australian Impressionism, Tom Roberts was an influential landscape painter and a major proponent of plein air painting in Australia. He produced many iconic nationally themed paintings, attempting to capture the unique atmosphere of the bush and of rural labour. Roberts arrived as a young man in Australia in 1869. He studied art under Louis Buvelot and Eugene von Guérard in Melbourne and later at the Royal Academy of Art, London. Travel through Spain, France and Italy exposed Roberts to artists who promoted notions of Impressionism and plein air principles. Returning to Melbourne at a period when artists were seeking to make a local response to the Australian landscape, his ideas were critical to the development of the Heidelberg School. 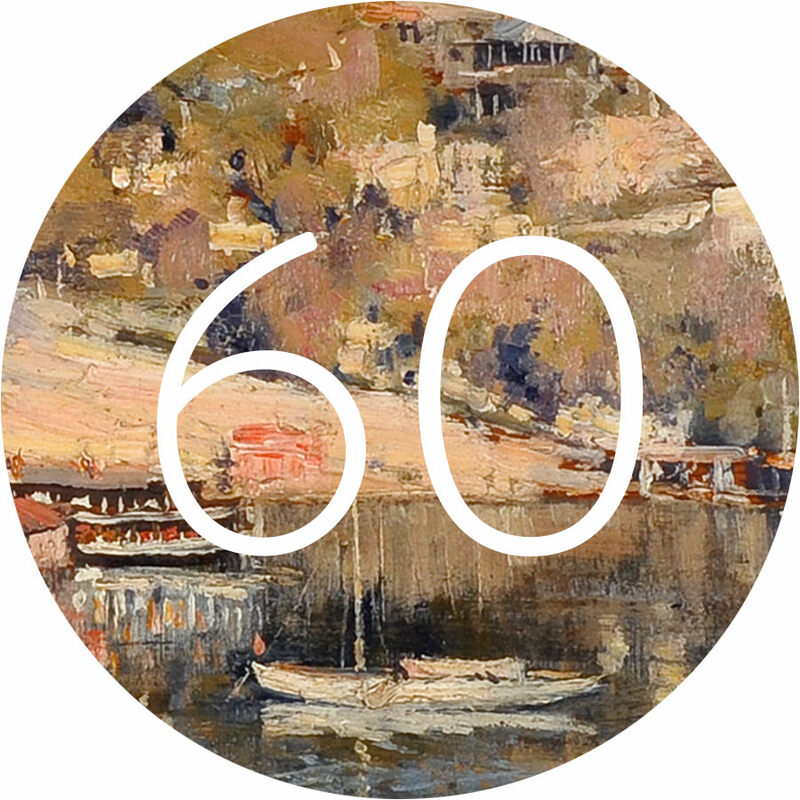 In 1891 Roberts moved to Sydney and established an artist’s camp at Sirius Cove, Mosman Bay, with Arthur Streeton and Arthur Fullwood. Mosman’s Bay is probably the most important painting in the Hinton Collection. A painting full of atmosphere and light, it depicts what all Australian plein air artists were attempting to capture on the northern shores of Sydney Harbour. The people at play and the suburb hidden in the trees, with a shimmering bright blue sky reflected on the green waters, demonstrates the links with the movement termed Impressionism. The oarsman, at the right edge, was discovered in 1983 when the work was unframed for conservation purposes.